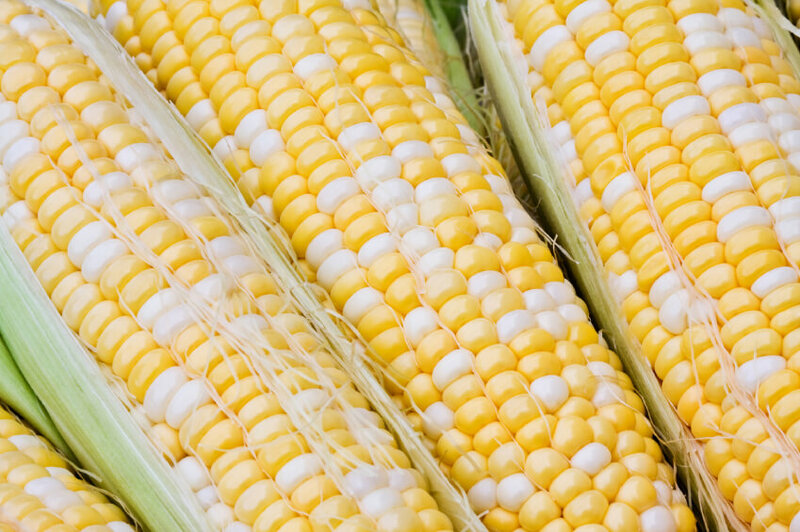 Anti-GMO ‘Big Lie’: Is labeling really about our “Right to Know”? If one believes the backers of mandatory labeling initiatives, it’s simple common sense: consumers have a “right to know” what’s in our food. That is the beguiling message promulgated by a myriad of activists linked to such organizations as Right to Know GMO, Label GMOs and Just Label It. It’s powerful and superficially persuasive. “To be clear the Just Label campaign is not an anti-GMO effort,” Gary Hirshberg, founder of organic food maker Stonyfield Organic, and director of Just Label It, has said repeatedly. After all, what but a conspiracy of the federal government and global corporations could be against providing helpful information to consumers about what they eat? Call it the Big Lie of many high profile pro-labeling advocates who use the fig leaf of the “right to know” meme to cover their true intentions: to undermine public confidence in crop biotechnology. In less guarded moments, Hirshberg makes it clear that the labeling movement has nothing at all to do with science, information and discourse—it is exclusively an anti-GMO effort. 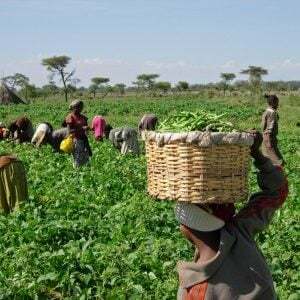 “Genetically modified organisms are one of the most dangerous and radical changes to our food supply,” he has said. Hirshberg has become a millionaire many times over selling pricey organic foods promoted with labeled marketing claims like “No Yucky Stuff,” which falsely suggests that more affordable conventional products are somehow unsafe and inferior. “Because GMOs are not labeled in the U.S., they might be causing acute or chronic effects,” Hirshberg has also written. The National Academies of Science of almost every country, World Health Organization, American Medical Association and nearly every other medical and food oversight organization in the world along with a host of scientific and scholarly societies have all concluded that GM crops are as safe as any other and pose no special risks to humans or the environment. According to a poll of scientists with the American Academy for the Advancement of Science, more scientists embrace the safety of GM crops than accept that climate change is partly human-induced (87%). Now that’s a consensus. There is not one proven or suspected case of so much as a sniffle from GMO consumption, let alone “acute or chronic” effects. Gary Hirshberg’s comments befit a scare-mongering demagogue–with the organic industry that he has come to represent as the main beneficiary. Let’s be clear. Many of the leaders of the ‘right to know’ movement are not being honers; the public record of their comments indicates they are out to dissimulate, demonize and destroy. These pro labeling organizations play the ‘right to know card’ as a subterfuge to scare people about the safety of the food system and to divert attention from the sustainability benefits of genetically modified crops and modern agriculture. Are there tradeoffs in adopting crop biotechnology or large-scale agriculture? Of course, and there is room for healthy dialogue. But make no mistake here: Rational discussion and transparency are not on the mainstream pro-label groups agenda. 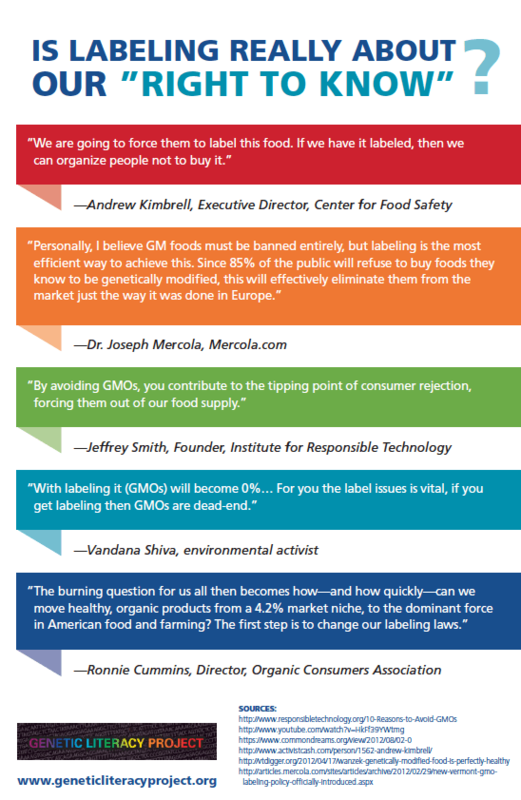 In this infographic, the GLP presents the actual words of the world’s most prominent pro-labeling activists—those who claim on NPR and the Nightly News that this issue is simply about a ‘right to know’ when their real agenda is just the opposite. Here are their comments made when their guard is down—when they speak among ‘friends’—people who the evidence suggests are dedicated to undermining public support for the science of genetic engineering and limiting consumer choice and right to know.